My 9-year-old daughter has told me there is a little boy in her class who is getting picked on because of the kind of shoes he is wearing. It’s quiet and mean, and this boy is not responding, so the teacher doesn’t know about it. My child comes home every day and tells me about the emotional torture this boy is enduring. How would you handle this? I applaud your daughter for recognizing bullying behavior and speaking up. That is something that is very hard to do, and she certainly deserves a lot of credit for sharing with you what is happening in the classroom. 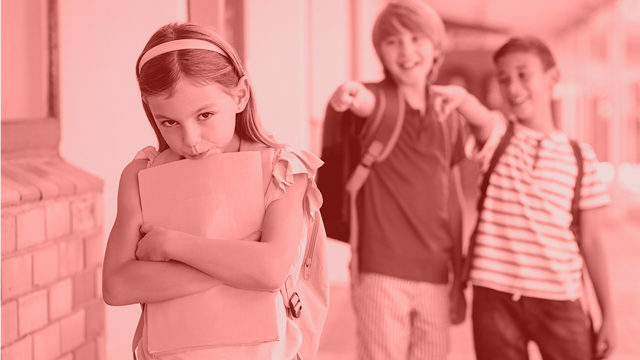 I labeled the behavior as bullying as it appears to meet the characteristics of bullying: intentional, reoccurring aggression from one person (or group) to another individual. Bullying is an imbalance of power where the victim does not have the tools and/or the ability to respond. There are four main types of bullying: physical, verbal, social, and cyber. The “emotional torture” you referenced certainly sounds like bullying – more specifically, verbal bullying. I would recommend that you notify the teacher as soon as you can about the dynamic that is occurring in the classroom. It is not uncommon for behavior to occur out of sight from adults, and it sounds like your daughter agrees that the teacher doesn’t know. There are so many avenues the teacher can explore to handle this situation and prevent any future bullying situations from occurring. It may not be a quick fix, but the teacher has to be aware of the problem before any solutions can be implemented. Ask your daughter if she feels comfortable discussing the behavior with her teacher, or if she would like you to be involved. Because your daughter is not directly involved, you may not be privy to any conversations the teacher has with the other students, but hopefully your daughter will come home and share several things – most importantly, that the behavior has stopped; and secondly, that the class has spent some time on team building, empathy building, and how to have a bully-free classroom. Any of these would indicate that the school is aware of the situation, and that measures are being taken to create a healthier, safer environment. I would also continue to check in with your daughter. Witnessing bullying behavior can be very upsetting. It can leave the person feeling helpless, frightened, or confused. Ask your daughter how she feels when she sees her classmate being picked on. Reassure her that she is courageous for speaking up, and explore whether or not there are other actions (other than notifying the teacher) that she feels comfortable taking in the classroom. Be patient with her, and let her figure out some strategies that may work before you jump in with your ideas. To facilitate this discussion, ask her the magic wand question: What would you do if you had a magic wand and could use it to help your classmate? She may want to buy him new shoes so that he isn’t picked on anymore. She may want the teacher to see the behavior when it happens. She may want the other classmate to get in trouble. There is no right or wrong answer, and it may generate some ideas of how she wants to proceed. She may want to invite the boy to sit with her at lunch or play at recess. She may want to confront the bully and tell that person to stop. She may want her classmates to get involved so that everyone in the class feels safe and has a friend. Often a key dynamic to bullying behavior is the reinforcement the bully receives from others. Unfortunately, many of us go along with a bully instead of standing up to one. Even as adults, we don’t want to be the next target or get hurt. We don’t know what to do or say, or we aren’t sure if the bullying is a joke or prank. The reasons why we don’t step in are many. Help your daughter explore some of these reasons, and she will be even more equipped to cope with the situation the next time she encounters a bully. Finally, your daughter has a great deal of courage, and you can continue to build on that so she feels more empowered and empathetic. The world in general needs more upstanders like her in its midst.